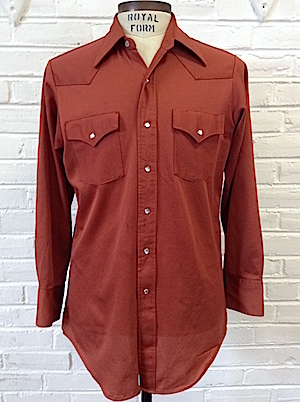 Mens Vintage 1970s Western shirt! 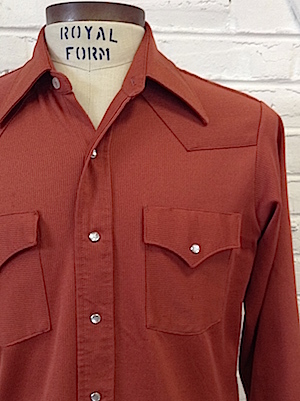 Ribbed, burnt orange shirt for the urban cowboy! Closes in the front with pearly white western snaps with three more on each cuff. Has two pockets on the chest with snap closures. Shirt has a tapered hem. Tagged by Lee. No material tag, but feels like 100% polyester. Made in the U.S.A. Condition: Good++. Has one snap in which the pearly part is shattered. There is some black-ish staining on the front of the shirt in light, patches. Shirt also has a few pulls in the front of the shirt and on the left sleeve. Still a wonderful classic cowboy top! Priced accordingly!